John Peltz worked for Kmart for 39 years. His wife, Sandy, was a member of the Alhambra Elementary School District governing board for 16 years. 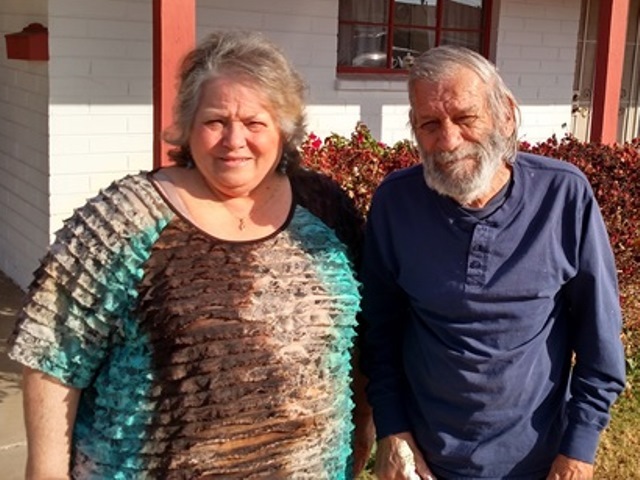 They’ve lived on West Mariposa Street, two blocks south of Grand Canyon University, for 40 years, and Sandy grew up just a few blocks away. 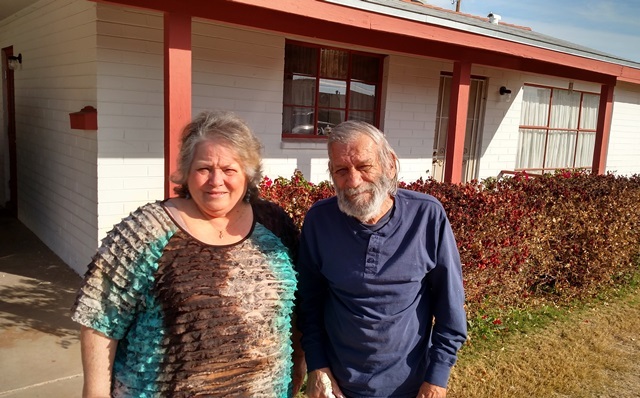 Sandy and John Peltz are grateful for the work that will be done on their home through GCU’s partnership with Habitat for Humanity. So it’s safe to say that the Peltzes know a few things about being loyal to their hometown. And when they found out that GCU was partnering with Habitat for Humanity to help renovate up to 700 homes in the surrounding neighborhood, it confirmed their belief that the University has the same spirit of perseverance and community support. “Being retired, this is a Godsend to us,” Sandy said. Early Saturday morning, 200 GCU students will cross Camelback Road and begin the task of tearing down and fixing up as the first eight local homeowners take advantage of an offer that John Peltz didn’t know about until he saw a flier publicizing it. The first phase of the Canyon Corridor Project, part of Habitat’s Neighborhood Revitalization Initiative, is scheduled to take 18 months, and the subsequent three phases will be spaced out over the subsequent two years. GCU is contributing $700,000 to Phase 1. Anyone can donate tax dollars to Habitat through GCU’s “Donate to Elevate: Giving Back, Raising Hope” program. To find out more, email Randy Bellah, program director in GCU’s Strategic Educational Alliances, at randy.bellah@gcu.edu. GCU students and staff who want to volunteer for the project should contact Cassandra Jarles, faith relations manager for Habitat’s Central Arizona affiliate, at 623-583-2417 or cassandra@habitatcaz.org. The work at the Peltzes’ home will include tearing down their wooden fence, which was blown over in storms, and replacing it with a block wall. Student workers, some of them team leaders and all of them working in conjunction with Habitat personnel, also will put in new siding on the house and replace all the windows with the double-paned variety. “He’s excited about the wall. I’m excited about the windows,” Sandy said, laughing. Having spent her whole life here, Sandy remembers GCU when it was, in her words, “a little tiny school in a big field.” Back then, she said, the area was mostly farmland, Camelback Road was a “slightly paved two-way street,” and when monsoon rains hit the Valley her father couldn’t take his usual route down Indian School Road because it was too muddy. Homeowners who take advantage of the GCU/Habitat offer are required to put in a minimum number of “sweat equity” hours, and John certainly has pitched in already. A tour of his backyard showed how he has removed plants and rocks from all around the fence to give workers easy access. “I realize I have to do my part,” he said. Habitat for Humanity has done its part by building, renovating or repairing more than 800,000 homes in 100 countries since 1976. The partnership between GCU and Habitat’s Central Arizona affiliate is one of the first of its kind. In addition to its monetary contribution, GCU is doing its part through the contributions of its students, such as Mary Khorany, a sophomore who wants to use her Business Management major to work with local missions and nonprofit organizations. Khorany is on the refugee ministry team of GCU’s Local Outreach, Global Outreach (LOGO), which couldn’t be more appropriate. Her family came here from Iraq when she was 2 and lived in west Phoenix for her first three years here. Even today, they hear horror stories from family and friends in their former home in Irbil, in the northern Iraq province of Kurdistan — stories of people fearing the advance of Islamic State rebels and fleeing to Turkey and other safe havens. “Even having family there, I can’t fathom what’s going on,” she said. While she respects and admires the work that GCU does in overseas missions, Khorany said her focus is local. A new era of fulfillment — and perseverance — starts Saturday. Like the Peltzes, GCU is in it for the long haul.